"Red state" and "Blue state" redirect here. For other uses, see Red State and Blue State. All states contain both liberal and conservative voters (i.e. they are "purple") and only appear blue/red on the electoral map because of the winner-take-all system used by most states in the Electoral College. However, the perception of some states as "blue" and some as "red" was reinforced by a degree of partisan stability from election to election—from the 2000 election to the 2004 election, only three states changed "color" and as of 2016 fully 38 out of 50 states have voted for the same party in every presidential election since the red/blue terminology was popularized in 2000. The choice of colors reverses a long-standing convention of political colors whereby red symbols (such as the red flag or red star) are associated with left-wing politics and right-wing movements often choose blue as a contrasting color. Indeed, until the 1980s Democrats were often represented by red and Republicans by blue. According to The Washington Post, the terms were coined by journalist Tim Russert during his televised coverage of the 2000 presidential election. That was not the first election during which the news media used colored maps to depict voter preferences in the various states, but it was the first time a standard color scheme took hold; the colors were often reversed or different colors used before the 2000 election. Even earlier, in the 1888 presidential election, Grover Cleveland and Benjamin Harrison used maps that coded blue for the Republicans, the color perceived to represent the Union and " Lincoln's Party", and red for the Democrats. The parties themselves had no official colors, with candidates variously using either or both of the national color palette of red and blue (white being unsuitable for printed materials). Since the 1984 election, CBS has used the opposite scheme: blue for Democrats, red for Republicans. ABC used yellow for Republicans and blue for Democrats in 1976, then red for Republicans and blue for Democrats in 1980 and 1984, and 1988. In 1980, when John Anderson ran a relatively high-profile campaign as an independent candidate, at least one network provisionally indicated that they would use yellow if he were to win a state. Similarly, at least one network would have used yellow to indicate a state won by Ross Perot in 1992 and 1996, though neither of them did claim any states in any of these years. 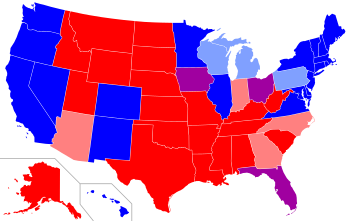 By 1996, color schemes were relatively mixed, as CNN, CBS, ABC, and The New York Times referred to Democratic states with the color blue and Republican ones as red, while Time and The Washington Post used an opposite scheme. NBC used the color blue for the incumbent party, which is why the Democrats were represented by Blue in 2000. Cartographers have traditionally limited the number of classes so that it is always clear which class a color shade represents. Some election maps, however, have broken this tradition by simply coloring each areal unit with a red-blue mixture linked to voting ratio data—resulting in an "unclassified choropleth map". These "purple maps" are useful for showing the highly mixed nature of voting, but are extremely difficult to interpret in detail. The lack of clear classes make these purple maps highly prone to the problems of color perception described above. However, there are pros and cons to both classified and unclassified choropleth maps. Each tend to bring out some patterns while obscuring others. All these points should be taken into account when looking at election maps. The paradigm has come under criticism on a number of fronts. Many argue that assigning partisanship to states is only really useful as it pertains to the Electoral College, primarily a winner-take-all system of elections (with the exceptions of Nebraska and Maine). The Democratic and Republican parties within a particular state may have a platform that departs from that of the national party, sometimes leading that state to favor one party in state and local elections and the other in Presidential elections. This is most evident in the Southern United States, where the state Democratic Party organizations tend to be more conservative than the national party, especially on social issues. Likewise, Republicans have elected a number of statewide officeholders in states that are solidly Democratic at the presidential level, such as New York, Illinois, Hawaii, and Vermont. The United States presidential election in Arkansas, 2004 as well as the one in West Virginia in 2004 were won by Republican George W. Bush, but Democrats at the time held all four U.S. Senate seats and a majority of elected executive officeholders in those states. Similarly, the United States presidential election in Tennessee, 2004 went to Bush in both 2000 and 2004, but going into 2004, its governor was a Democrat and both chambers of the state legislature were controlled by Democrats as well. The converse can also be true, as in the case of the United States presidential election in Maine, 2004, which had two Republican U.S. Senators, but the states were won by Democrat John Kerry. Likewise, Vermont, New York, Massachusetts, Maryland, and Hawaii all voted in wide margins for Democrat Kerry, but all had Republican governors at the time. In April 2008, Republican presidential nominee John McCain predicted that the 2008 presidential election would not follow the red state/blue state pattern, saying, "I'm not sure that the old red state, blue state scenario that prevailed for the last several elections works. I think most of these states that we have either red or blue are going to be up for grabs." Arguably, this eventually proved to be somewhat true, but not in McCain's favor as Obama won three "red" states that had not voted Democratic in many years, namely Virginia, North Carolina, and Indiana along with a part of deep red Nebraska, via the state's second congressional district. Obama also came close to winning Missouri, losing it by only a 0.2% margin. Notably, however, the only deviations from the preexisting red-blue paradigm were all in Obama's favor. 2008 United States presidential election results by county, on a color spectrum from Democratic blue to Republican red. The demographic and political applications of the terms have led to a temptation to presume this arbitrary classification is a clear-cut and fundamental cultural division. Given the general nature and common perception of the two parties, "red state" implies a conservative region or a more conservative American, and "blue state" implies a more liberal region or a more liberal American. But the distinction between the two groups of states is less simplistic. The analysis that suggests political, cultural and demographic differences between the states is more accurate when applied to smaller geographical areas. Traditionally, the practice of designating a U.S. state as "red" or "blue" is based on the "winner-take-all" system employed for presidential elections by 48 of the 50 U.S. states and the District of Columbia. Electoral law in Maine and Nebraska makes it possible for those states to split their electoral votes. All states were consistent in voting for George W. Bush or his Democratic Party opponent in the 2000 and 2004 presidential elections, except for three, namely New Mexico ( Al Gore in 2000 and Bush in 2004); Iowa (Gore in 2000 and Bush in 2004); and New Hampshire (Bush in 2000 and Kerry in 2004). The 2004 election showed two of these three states to be true to the presidential preferences of their respective regions, creating a greater regional separation; thus, an argument that the country was more divided from the 2000 election. All three of those states were very close in both elections. In 2008, Obama carried Iowa and New Hampshire by more than nine percentage points, and New Mexico by double digits. In reality, many of the Great Plains and Rocky Mountain states which voted for Bush are relatively sparsely populated (Nebraska, for instance, has a population similar to the island of Manhattan). While the "blue states" represented a comparatively small geographic area, they contained large populations, which ended up making President Bush's national level of support slimmer than the red–blue map would seem to indicate. Various different maps, such as ones which coded states based on the strength of their support for one candidate or another, ones which gave results based on county, or ones which displayed states according to the size of their population, were proposed as correctives to this perceived flaw. Feelings of cultural and political polarization between red and blue states, which have gained increased media attention since the 2004 election, have led to increased mutual feelings of alienation and enmity. The polarization has been present for only three close elections (2000, 2004 and 2016). In the 1996 election, 31 U.S. states were "blue" (i.e. they voted for Democrat Bill Clinton) and 19 "red" (i.e. they voted for Republican Bob Dole), though at the time the current color scheme was not as universal as today). One trend that has been true for several election cycles is that states that vote Republican tend to be more rural and more sparsely populated (thus having fewer electoral votes) than states that vote Democratic. Although the Electoral College determines the Presidential election, a more precise measure of how the country actually voted may be better represented by either a county-by-county or a district-by-district map. By breaking the map down into smaller units (including many " blue counties" lying next to " red counties"), these maps tend to display many states with a purplish hue, thus demonstrating that an ostensibly "blue" or "red" state may, in fact, be closely divided. Note that election maps of all kinds are subject to errors of interpretation. These county-by-county and district-by-district maps reveal that the true nature of the divide is between urban areas/ inner suburbs and suburbs/ rural areas. For example, in the 2008 elections, even in "solidly blue" states, the majority of voters in most rural counties voted for Republican John McCain (good examples would be Minnesota, New York, New Jersey and Maryland), with some exceptions. In "solidly red" states, a majority of voters in most urban counties voted for Democrat Barack Obama; good examples for this would be Dallas County, Texas and Fulton County, Georgia (the homes of major U.S. cities Dallas and Atlanta, respectively). Both provided Obama with double-digit margins of victory over McCain. An even more detailed precinct-by-precinct breakdown demonstrates that in many cases, large cities voted for Obama, but their suburbs were divided. Red states and blue states have several demographic differences from each other. The association between colors and demographics was notably made in a column by Mike Barnicle[ citation needed], and reinforced in a controversial response from Paul Begala[ citation needed], though the association between demographics and voting patterns was well known before that. In the 2008 elections, both parties received at least 40% from all sizable socioeconomic demographics, except that McCain (Republican) received 37% from voters earning $15,000–$30,000, and 25% from voters earning under $15,000, according to exit polling. In 2008, college graduates were split equally; those with postgraduate degrees voted for Obama by an 18% margin. By household income, Obama got a majority of households with less than $50,000 in annual income. McCain got a slight majority (52% to 47%) of households consisting of married couples; Obama led almost 2–1 (65% to 33%) among unmarried voters. McCain held the more suburban and rural areas of both the red and blue states, while Obama received the large majority of the urban city areas in all the states. Independent candidate Ralph Nader did not win any electoral college votes, yet he received 2% of the vote of voters from high-income households and voters with graduate degrees. As a group, young adults under age 40 sided with Obama. More married men voted for McCain, but more single men voted for Obama. Generally, the same held true for married versus single women, but a higher percentage of women overall voted for Obama than for McCain. Catholic and Protestant Christians were more likely to vote for McCain than for Obama, whereas voters of other faiths, as well as secular atheist and agnostic voters, predominantly favored Obama. [ citation needed] White, middle-aged, Christian, married males made up McCain's largest constituency. ^1 : Split their votes. The "Democratic blue" and "Republican red" color scheme is now part of the lexicon of American journalism. ^ a b c d Battaglio, Stephen (November 3, 2016). "When red meant Democratic and blue was Republican. A brief history of TV electoral maps". Los Angeles Times. Retrieved November 28, 2018. ^ Gelman, Andrew (2014). "The Twentieth-Century Reversal: How Did the Republican States Switch to the Democrats and Vice Versa?". Statistics and Public Policy. 1: 1–5. CiteSeerX 10.1.1.309.9174. doi: 10.1080/2330443X.2013.856147. ^ "Most Americans live in Purple America, not Red or Blue America". Retrieved September 9, 2016. ^ "America really looks like this - Chris Howard's Writing & Art". Retrieved September 9, 2016. ^ "Dave Leip's Atlas of U.S. Presidential Elections – FAQ". uselectionatlas.org. Retrieved November 7, 2014. ^ "MSNBC.com About Meet the Press". Retrieved June 13, 2008. ^ "news of the wired". Retrieved December 1, 2013. ^ "The Political Game: The Red and Blue State Phenomenon". politicalgame.blogspot.com. Retrieved November 7, 2014. ^ "Handbook of Texas Online – REDS AND BLUES". tshaonline.org. Retrieved November 7, 2014. ^ "Blogger". Retrieved September 9, 2016. ^ a b Ben Zimmer (June 17, 2008). "Thinking about Tim Russert, Red States and Blue States". Visual Thesaurus. Retrieved November 4, 2010. ^ Kevin Drum (November 14, 2004). "Red States and Blue States .... Explained!". The Washington Monthly. Retrieved November 4, 2010. ^ Zeller, Tom (February 8, 2004). "Ideas & Trends; One State, Two State, Red State, Blue State". The New York Times. Retrieved May 22, 2010. ^ Goodman, Walter (November 6, 1996). "Those Special Election Bells, Whistles and, Yes, Some Numbers, Too". The New York Times. Retrieved May 22, 2010. ^ Apple, Jr., R. W. (November 7, 1996). "A Divided Government Remains, and With It the Prospect of Further Combat". The New York Times. Retrieved May 22, 2010. ^ Brooks, David (December 2001). "One Nation, Slightly Divisible". The Atlantic Monthly. Retrieved November 2, 2010. ^ Brownstein, Ron (September 3, 2001). "Learn the signs of your political colors". CNN. Archived from the original on April 3, 2013. Retrieved November 3, 2010. ^ Published: February 08, 2004 (February 8, 2004). "Ideas & Trends; One State, Two State, Red State, Blue StateΨ Page 2 – New York Times". Nytimes.com. Retrieved November 8, 2012. ^ Ellen K. Cromley; Sara L. McLafferty (2011). GIS and Public Health, Second Edition. Guilford Press. p. 132. ISBN 978-1-60918-750-7. Retrieved June 12, 2012. ^ Daniel Araya; Yana Breindl; Tessa J. Houghton (2011). Nexus: New Intersections in Internet Research. Peter Lang. p. 72. ISBN 978-1-4331-0970-6. Retrieved June 12, 2012. ^ Martin, David (1996). Geographic Information Systems: Socioeconomic Applications. Routledge. p. 170. ISBN 978-0-415-12571-0. ^ a b Senay, Hikmet; Ignatius, Eve. "Rules and Principles of Scientific Data Visualization". Department of Electrical Engineering and Computer Science, The George Washington University. Retrieved November 21, 2010. Saturation may be affected by the size of a colored figure, with greater exponents for smaller areas. The same color placed in a smaller area appears "denser" and hence, more saturated. ^ a b Andrienko; Andrienko, Gennady (2006). Exploratory Analysis of Spatial and Temporal Data: A Systematic Approach. Birkhäuser. pp. 217–221. ISBN 978-3-540-25994-7. Retrieved November 21, 2010. ^ Obama, Barack (July 27, 2004). "Keynote Address at the 2004 Democratic National Convention". BarackObama.com. Archived from the original (text or video) on April 3, 2008. Retrieved April 4, 2008. ^ a b Gastner, Michael; Shalizi, Cosma; Newman, Mark (2004). 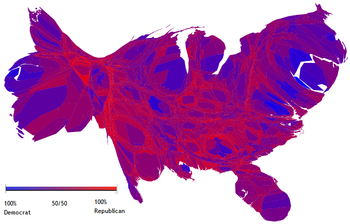 "Maps and cartograms of the 2004 U.S. presidential election results". University of Michigan. Retrieved November 3, 2010. ^ a b Rose, Phil Fox (November 7, 2012). "We Are All Purple: The Destructive Lie of Red States and Blue States". Patheos. Retrieved November 7, 2012. ^ Fabrikant, Sara Irina (2000). "Cartographic variations on the presidential election 2000 theme". UC Santa Barbara, Department of Geography. Archived from the original on August 18, 2010. Retrieved November 3, 2010. ^ Finkel, David (April 26, 2004). "For a Conservative, Life Is Sweet in Sugar Land, Tex". The Washington Post. Retrieved November 3, 2010. ^ Bishop, Bill (2009). The Big Sort: Why the Clustering of Like-Minded America is Tearing Us Apart. Mariner Books. ISBN 978-0-54723-772-5. ^ DeSliver, Drew (June 30, 2016). "Electorally competitive counties have grown scarcer in recent decades". Pew Research Center. Retrieved December 28, 2017. ^ Aisch, Gregor; Pearce, Adam; Yourish, Karen (November 10, 2016). "The Divide Between Red and Blue America Grew Even Deeper in 2016". The New York Times. Retrieved December 28, 2017. ^ a b Haidt, Jonathan (May 2012). "Born This Way?". Reason.com. Retrieved December 28, 2017. ^ a b Wasserman, David (March 8, 2017). "Purple America Has All But Disappeared". FiveThirtyEight. Retrieved December 28, 2017. ^ "Election 2016: Exit Polls". The New York Times. Retrieved November 9, 2016. ^ "Exit Polls 2016". CNN. Retrieved December 28, 2017. ^ " Democrats' new logo: Change you can sell?." The Week. 2010-09-16. Retrieved 2014-11-14. ^ "BBC NEWS". bbc.co.uk. Retrieved November 7, 2014. ^ "Amerika wählt – SPIEGEL ONLINE – Nachrichten". ^ "elmundo.es - ELECCIONES EEUU 2004". Retrieved September 9, 2016. Starkey, David (2007). Living Blue in the Red States. Lincoln, NE: University of Nebraska Press. ISBN 978-0-8032-6008-5. "The Urban Archipelago: It's the Cities, Stupid". The Stranger. Retrieved November 3, 2010. Wikimedia Commons has media related to Red State-Blue State Divide. McPherson, Tara. "Re-imagining the Red States: New Directions for Southern Studies." Southern Spaces, December 14, 2004, http://southernspaces.org/2004/re-imagining-red-states-new-directions-southern-studies.